On Wednesday, Democratic City Council Rafael Espinal introduced a bill that would ban plastic straws and stirrers in all venues across New York City. Everywhere from coffee shops and bars to restaurants and stadiums would no longer provide customers with plastic straws. Plastic pollution has been a growing concern in New York, as well as in other parts of the country, and under Espinal’s legislation, plastic would be replaced with metal. People with disabilities or medical conditions would not be subject to the proposed law, but for all others, breaking the law would result in a $100 fine. If the law passes, New York would join Malibu, Seattle, and Miami Beach in other states that have already banned plastic straws. Internationally, Vancouver has voted to ban plastic straws, while Scotland and Taiwan aren’t far behind permanent bans. Additionally, New York would become the largest city in the world to ban plastic straws thus far. According to Eco-cycle, Americans use approximately 500 million straws per day - which is roughly 1.6 straws per person per day. On that same note, up to 12 million metric tons of plastic end up in oceans each year. The Wildlife Conservation Society (WCS) supports Espinal’s bill, with Executive Vice President John Calvelli reporting that plastic straws are one of the top ten sources of beach litter. “The sad thing is that probably by 2050 there will be more plastic, by weight, in the ocean, than fish,” he said. WCS has created its own campaign -- Give a Sip -- to highlight the environmental damages of disposable straws. “Through local field research, policy initiatives, and public outreach, our team seeks to protect and restore threatened species and critical habitats, encourage smart ocean planning to ensure a safe place for wildlife in our busy waters, and build ecological resilience in nearshore and river habitats,” the Give A Sip website reads. The Give A Sip campaign reports that 71 percent of seabirds and 30 percent of sea turtles have been found with plastic in their stomachs. In Spain this past April, a dead whale washed onto shore with over over 60 pounds of garbage -- primarily consisting of plastic -- in its body. Straws are the latest piece of plastic legislators are going after in an attempt to reduce pollution; however, efforts have been far more successful abroad than here in the U.S. 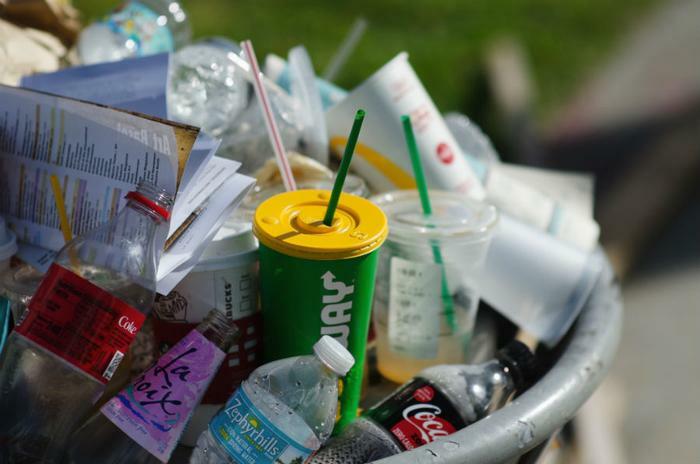 In February, the government of Taiwan announced that it will be banning most single-use plastic items -- such as straws, bags, and cups -- by 2030. Similarly, Scotland announced that it will be banning cotton-tipped plastic ear swabs and straws by 2019. The UK recently banned microbeads -- the small plastic beads commonly found in exfoliants and other body washes. Stateside, two Hawaii hotels -- the Modern Honolulu and the Hilton Waikoloa VIllage -- stopped serving guests drinks with plastic straws. The hotels will now be serving drinks straw-less, unless guests request a straw, in which case it will be a paper straw. Portland farm-to-table restaurants have followed suit, as did restaurants in Davis, California. Perhaps the biggest name to ban straws as of late is McDonald’s. The fast food giant will start phasing out straws in 1,300 of its U.K. restaurants starting this May and replacing them with paper straws. Moreover, the company will not be handing out straws to every customer; instead workers will keep them behind the counter and give them to customers upon request. In regards to banning straws in NYC, Espinal is confident his bill will prove to be beneficial for New Yorkers, unlike Governor Cuomo’s April 2017 proposal to instate a five-cent charge on each plastic bag used by consumers throughout the state.